Get ready for the complaints to start rolling in. Now, just stop it all you haterz and nay-sayers! 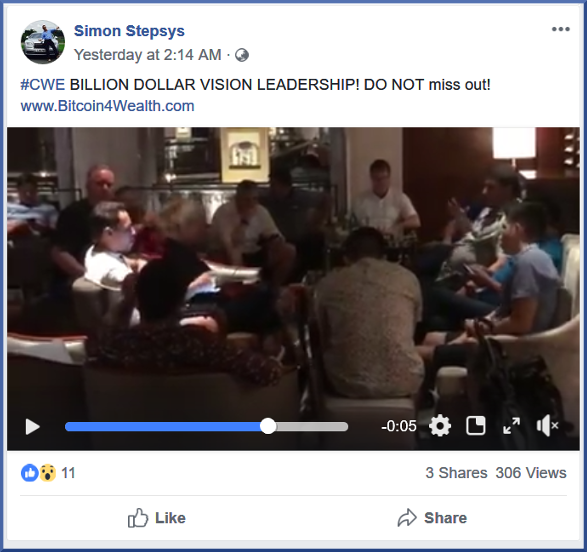 CWE is on fire.....Simon says so, so it MUST be true! 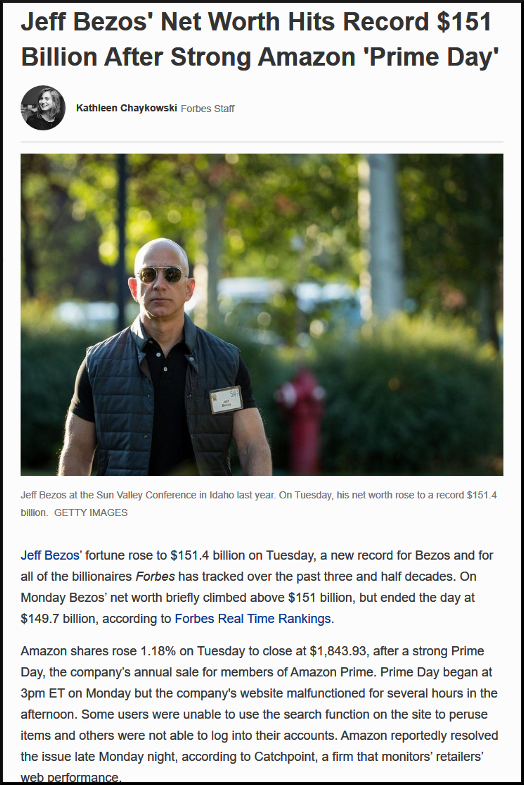 Just like his last company was.....now remind me, was that Usi-tech, My Advertising Pays, Banners Broker or Empower Network? Although it really doesn't matter, we all know how fabulously well they all worked out, don't we? Honestly, I've never known anyone with more front than this guy, although yes, I agree there's HUGE competition for that honour. He's absolutely shameless. And what gets me, is he seems to get away with it! People keep on buying in to his stories, meanwhile the UK authorities just ignore him!!! 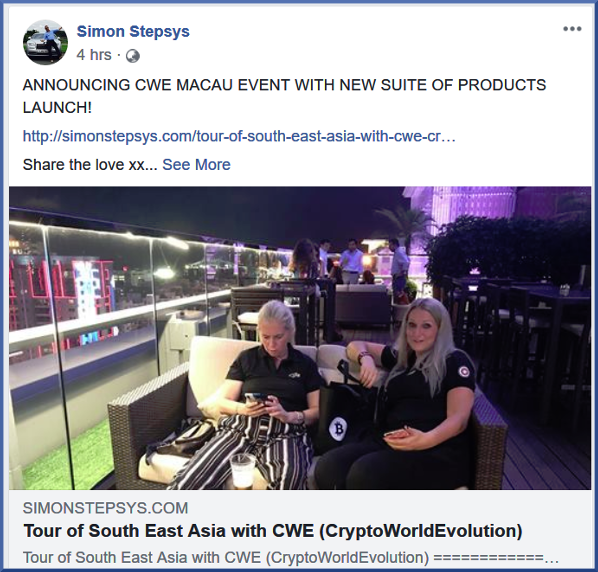 Rather than being "on fire" as Septic Simon Stepsys claims, Crypto World Evolution is actually "under water"
Maybe the septic one should have quit while he was ahead, taken all those "coff" millions "splutter" he supposedly made in My Advertising Pays and Banners Broker "guffaw" and retired "smirk"
Simon knows that he has around 90 days left before he has to move on to his next Ponzi-de-Jour so he is nowhere around when this one crashes and burns. Of course he tells everyone not to pay attention to us "haters" and of course the Alexa rankings don't mean a thing when they are going down, only when they are going up does it matter. Funny how that works isn't it. So I expect him to be pimping this really hard at least through September unless there is a drastic nose-dive in August of CWE's Alexa ranking. All he has at risk are his referral commissions. He's already out with his investment dollars back with a tidy return. shipdit, Della Cate, Fat City, LA and 1 others like this. What in the world are all of you "legends and leaders" complaining about? You don't see Simon Stepsys, Frank Calabro Jr or James Lockett complaining about anything, do you? Oh wait - that's right. They make their money selling you this crap. Della Cate, ribshaw, Bestbud and 2 others like this. Anyone still thinking we were wrong and Septic Simon Stepsys was right all along ??? shipdit, Bestbud and Chuck like this. Another 600 drop in Alexa ranking for Crypto World Evolution, continuing the downslide which began in the first week of May, as shown. There is little or no chance of anyone who deposited after that date earning enough to get into "profit"
I sincerely hope people took notice of our warning and got their money out of Crypto World Evolution in time. If they didn't, it's way too late now. Expect the downward trend to accelerate as more members become aware the game is over. The remaining players and pimps will do their best to extract every last drop. Any wild idea will do while they've still got fish on the line. And an Amazon according to Simple Simon. The "new Amazon" Eh ???? Umm, New Amazon I don't think so. "Coming" spelled comming in their big promo video? Is it going to turn out that this whole SCAM has been run by a couple of teenagers in Malaysia? 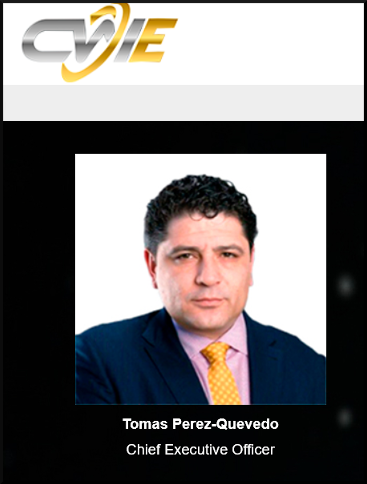 I was really impressed with Jules' interview of Tomas Perez-Quevedo. Such hard hitting questions and his responses. An interview for the ages. OK enough sarcasm. I was really impressed with Jules' interview of Tomas Perez-Quevedo. Such hard hitting questions and his responses. An interview for the ages. Here's hoping the rest of Septic Simon Stepsys' world tour is prepaid and non refundable. Better get in quick, though. 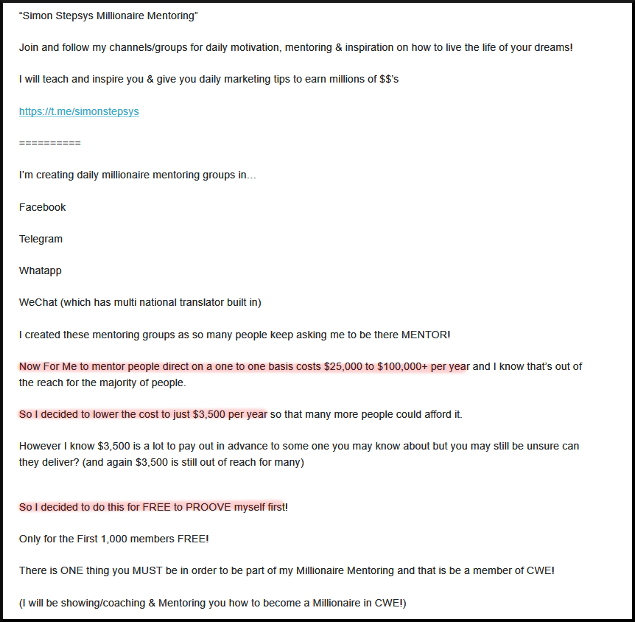 How many people would you guestimate have paid Septic Simon Stepsys $100,000+ for one on one millionaire training ?? ?